What are the kinds of things that scare you that are in your home? Certainly, the occasional spider sighting is cause for alarm. Maybe what your dog can do with his muddy paws is scary. What about all the junk that is overtaking your closets, garage, attic and bedrooms? Yes, that can be downright scary, too. Are you ready to goodbye to that scary junk? Then you’re ready to work with Junk King Sacramento. Junk King Sacramento has a proven track record of success when it comes to removing unwanted rubbish from homes, schools, apartments, offices, restaurants and vacant lots. A two-man moving crew is assigned to every junk removal appointment. They are extremely hard workers who just need to be told what has to be taken away. You don’t have to figure out how they’re going to get it down the stairs or around a corner. The Junk King crew has that covered. They’re also licensed and insured so you know you can trust them. You part in this operation is to decide what specific items you want taken away. You might need to sort through a bunch of boxes to keep the keepsakes and pack up everything else. As for the big objects like a couch or mattress, you can leave it right where it is. The Junk King crew will pick it up from there. 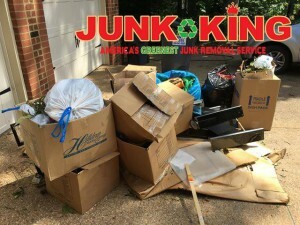 As soon as you’ve locked down what you want to get taken away, give Junk King a call. They might send over a crew in just a couple of hours. If you’d rather wait until the weekend, that can happen, too. When you set up that appointment, you might be given an initial estimate over the phone but a final price can’t be locked down until the crew has had a chance to see everything in person. They’ll be looking to see how they can pack all that stuff onto the truck. It’s not unlike a big game of Tetris! The flat fee covers all the labor even if they have to stay a bit longer to take something apart. Getting rid of scary junk has never been easier thanks to Junk King Sacramento being on the scene. This entry was posted in sacramento junk removal and tagged clutter, junk, Junk King, junk removal on October 31, 2017 by Junk King. Last updated November 2, 2017 .